A strange psychological condition seems to descend upon many Westerners when they land in Shanghai or Beijing and board the mag-lev train or start driving up the smart new motorway into town. It consists of the conviction that since change in China has been so dramatic, it must all be unprecedented. Such shock and awe is not surprising, since the pace of developments in China during the 1990s and the current decade have indeed been spectacular, and we cannot expect everyone to have a strong sense of Asian history. But it has unfortunate results, for it leads to a belief that the future must simply be more shock and more awe. What those with a sense of history—especially economic history—know is that the broad shape and nature of China’s growth since the 1980s has been pretty similar to the pattern shown in earlier post-war decades by Japan, South Korea, Taiwan and other East Asian success stories. There have been many differences in details and in the exact policy mix, but they have all shared the crucial characteristics of high structural saving rates, high investment and solidly positive overall productivity growth. What this means, in addition, is that the experiences of the earlier developers can be used to cast light on the evolution of China and even from now on of India. Both China and India have, at times, looked wholly exceptional. Their populations are the main reason. But also both chose, for the first four post-1945 decades, to be largely closed to trade and foreign investment. China continued to look exceptional for political reasons during the 1980s and especially after the Tiananmen massacre in 1989. It seems extraordinary now, but when in 1993 the World Bank published its landmark study of Asia, “The East Asian Miracle”, it omitted China from its analysis, arguing that China’s “transition experience…was considered sui generis”. Now, China is so much the hub of an East Asian production network that no one could look at it separately: hence in 2007, when the World Bank published a sequel, “The East Asian Renaissance”, China took centre stage in the analysis. This time, India was the striking omission, one that will also look odd in 10-15 years’ time when the next sequel appears. Historical parallels can never offer precise guidance. But they can offer clues as to the sort of stresses and strains that might arise when countries reach the same sort of points as their predecessors have done. Because many Westerners want to believe that China’s growth might be a bubble, the favourite Japanese parallel among those inclined to look for one has in recent years been the 1980s and early 90s, when an amazing stock- and property market boom in Japan turned into a spectacular bust, followed by 15 years of stagnation. Yet that parallel looks implausible, both because China remains far poorer now than Japan was then and because its stock- and property markets have played a much smaller economic role than was the case in 1980s Japan. Rather, a much more apposite parallel looks to be Japan in the early 1970s. …For two decades, the government treated environmental protection as a distraction from economic growth…Breakneck industrialisation produced some of the worst air and water pollution in the world. According to environmental officials, acid rain is falling on one-third of the country, half of the water in its seven largest rivers is “completely useless”…one-third of the urban population is breathing polluted air. More than 70% of the rivers and lakes are polluted, and ground water in 90% of the cities is tainted. Which countries are these books writing about? Either of the extracts could be about China, but only the second one actually is. That extract comes from the book called “China: Fragile Superpower” that was published in 2007 by Susan L. Shirk. The sentences in the first extract have been disguised a little. That is because they come from a book about Japan that was published more than three decades earlier, called “Japan: The Fragile Superpower”, by Frank Gibney. Clearly, fragility and Asian superpowerdom go together. The “lake” I inserted into Mr Gibney’s extract was actually an area called the Inland Sea, a sea channel which lies between the main island of Honshu and the two smaller islands to its south and south-west, Shikoku and Kyushu. Industrial cities such as Osaka, Kobe and Hiroshima can be found on or near that coast. The figure of 20,000 complaints was from 1966 and that of 76,000 from 1971. The place where hundreds fell ill from eating fish was, of course, Minamata Bay in Kyushu where a Japanese company, Chisso, poured methyl mercury into the sea during the 1950s and 1960s with disastrous consequences for local people’s health that are still being seen today. The cadmium poisoning was caused by the Mitsui Mining and Smelting Company and produced a disease known as itai-itai, or “it hurts, it hurts”. The mercury-filled drainage came from a company called Showa Denko whose effluent caused a second outbreak of Minamata disease, in Niigata prefecture in north-west Japan. If you look at a photograph taken in a Japanese city in 1965, say, or 1970—in Tokyo or Osaka, or a city with industry right at its heart such as Kita-Kyushu—you will find a strong resemblance to the appearance of most big Chinese cities today, including Beijing, Guangzhou, Shanghai and Chongqing. The air is thick with smog and dust. Days when blue skies can be seen are rare causes for celebration. If you go to any of those Japanese cities now, however, the air is completely different. Blue skies can be seen. Breathing is easy. People need to wear face masks only when they are suffering from colds, not to try to filter out pollution, as they did during the 1960s. It is no longer hazardous to be a traffic policeman. What happened in Japan to clean the air was a combination of two things. One was popular protest, which even in a democracy dominated by a single party, the Liberal Democrats, forced government policy to change. The country’s first proper environmental laws were passed in the early 1970s, limiting emissions from factories and forcing car makers to sell cleaner vehicles. The second was macroeconomic: the revaluation of the yen in 1971 when America abandoned fixed exchange rates, followed by the oil shock of 1973 when the Arab members of OPEC cut supplies of oil and sharply raised the price. This sudden change in Japan’s macroeconomic circumstances brought about an abrupt switch in the country’s industrial structure and emphasis. Capital investment in heavy, polluting industry began to drop. Energy had become more expensive, and government policy made it more expensive still, by imposing taxes on it even once the market price fell back. Companies adopted energy-saving, more efficient technology, and started to make products that fitted the new, cleaner times, especially cars. It was also at this point that electronics companies, encouraged by the government, made big investments in new, high-tech gadgetry, leading the economy in a new direction. The question now is whether China can and will follow the same path. It certainly shares Japan’s pollution problems and a well of resentment overseas at its current-account surplus, huge foreign reserves and artificially cheap currency. 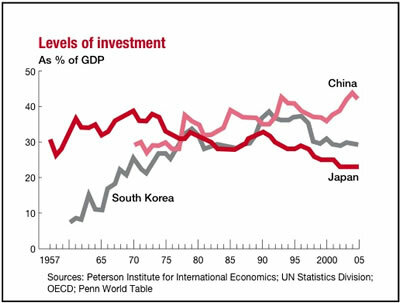 In China, investment has reached an even higher share of GDP (45%) than it did at its peak in Japan in 1970 (just below 40%). What China has not had until now is a strong domestic reason to do anything much about these things. But that has now arrived, in the form of inflation. Japan was forced into a sharp revaluation of the yen and a radical restructuring of its industrial structure by the combination of Richard Nixon and the oil shock. China has no Nixon. But it does have an oil shock of its own, in the form of rapidly rising food and energy prices, which have forced inflation up to more than 8% a year. 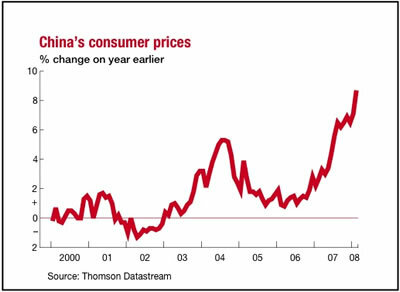 In the 1980s, high inflation caused domestic dissent, leading to the protests in Beijing and many other cities that culminated in the Tiananmen massacre of 1989. The Communist Party is acutely aware that inflation could again threaten its control. Indeed, despite the propaganda focus on the “Dalai Lama clique” after the Tibetan unrest in March, wise Communist leaders will have noted that inflation, and resentment at inequality, were also important factors behind the unrest. What China needs to do now is to follow the Japanese example of the 1970s: to use a currency revaluation and tight monetary policy to get a grip on inflation, to use fiscal policy to support demand in the economy, and to enforce environmental laws in order to stave off public protests about pollution. 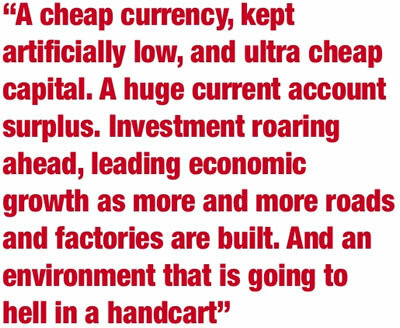 If this move is successful, China will accelerate its existing industrial move upmarket, start to clean up its environment, and, like Japan from 1975 to 1990, still have plenty of scope for healthy rates of economic growth. 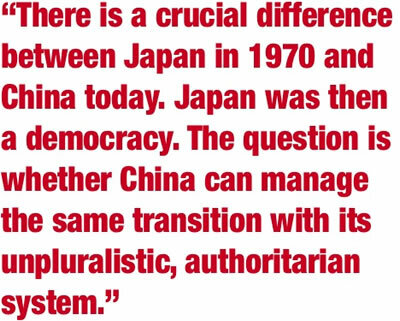 There is, however, a crucial difference between Japan in 1970 and China today. It is that Japan was then a democracy, able to absorb stresses and strains through the workings of pluralism, and able to forge a consensus among big companies and unions. The question is whether China can manage the same transition, with its unpluralistic, authoritarian system. What the experience of other East Asian countries shows is that long periods of rapid growth require transitions from stage to stage every decade or so. China looks poised to pass through its next transition quite soon. Whether it will be smooth or not is quite a different question. Bill Emmott, former Editor of The Economist, is the author of Rivals: How the Power Struggle Between China, India and Japan Will Shape Our Next Decade, published by Harcourt.